Well...most of my picks. I accidentally re-purchased Splatter Spell instead of getting Cauldron Couture. I'll probably be adding it to this post later in the week. 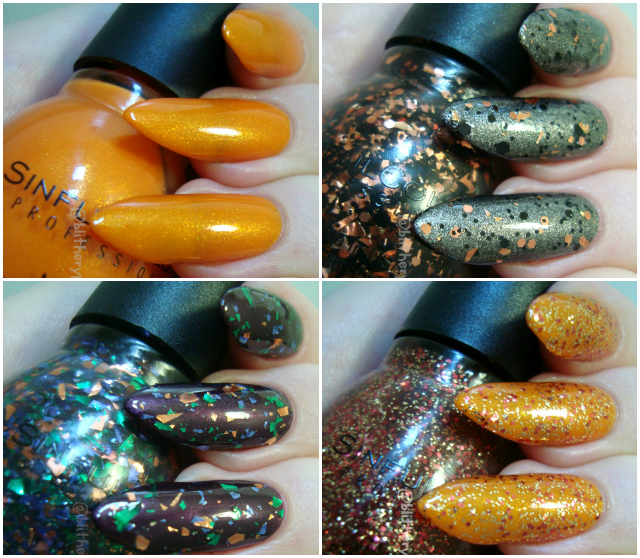 This is the week because...the 99¢ Sinful Colors Sale is back at Walgreens! Normally I'd post massive spam, but since the last sale was just a month ago, everything I'd be adding would be in this post. I love that they're doing these so often, especially since I only finally found the big Wicked Color display yesterday. There are three new shades, a popular seasonal repromote, and numerous core shades in this display. I have almost all of them this time around! 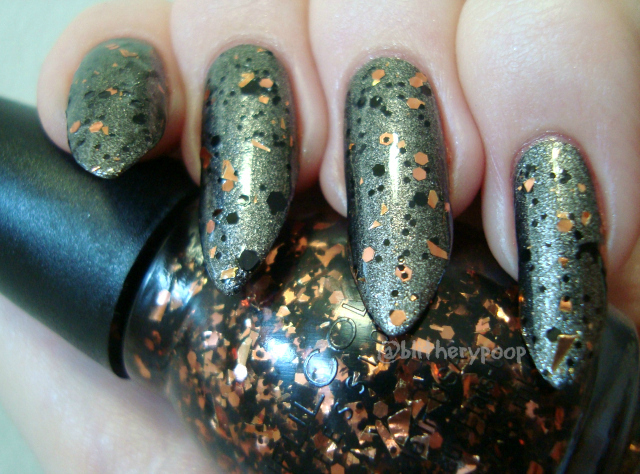 Splatter Spell has several sizes of black and orange hexagonal glitter, plus orange shards, in a clear base. My shard crisis continues! I love this! I think it helps that the shards take a back seat to the glitter. 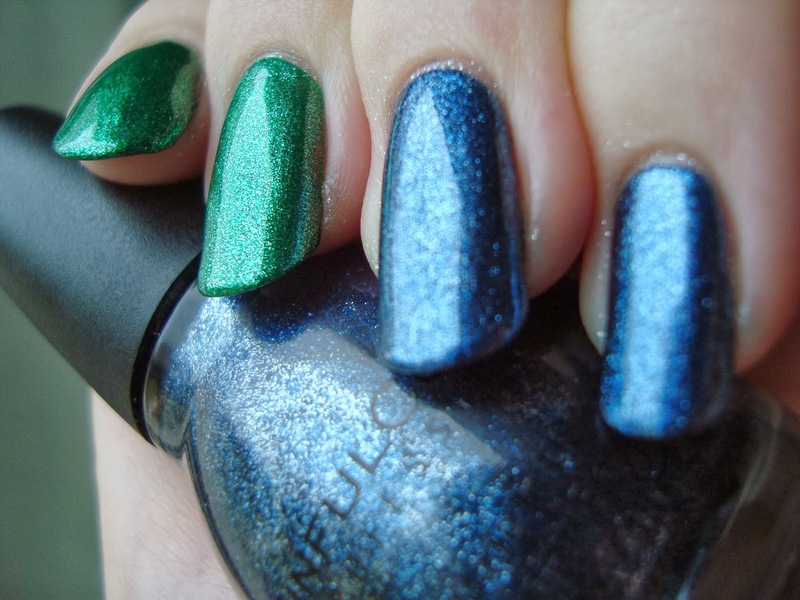 Cauldron Couture is similar, but green, and I'm absolutely going back for it now. The formula's decent and doesn't take much effort to get a pleasant result. Mystery Moonshine has green, periwinkle, and orange shards in a clear base. Zeus made a face, and I'm on the fence about it too. The shards are kinda unruly and pokey. It's similar-ish to Sally Hansen Mind Your Manors, but the blue-y bits aren't as blue and the shards don't lay as flat. 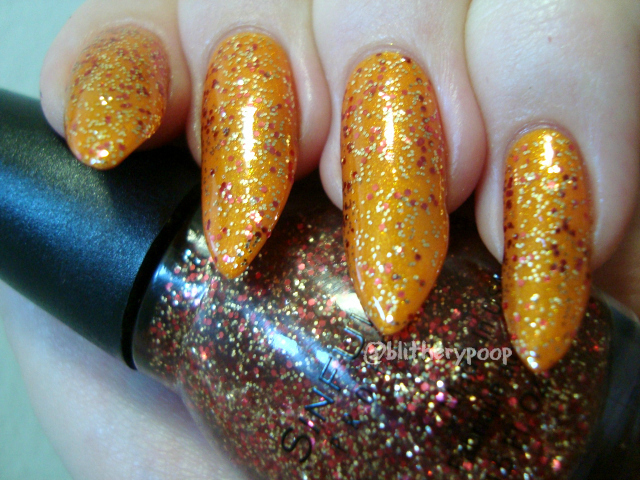 Pumpkin Spice has tiny gold and small red glitter in a clear base. Back in 2012 when Pumpkin Spice first came out, I passed on it. Last year too. I was stupid and wrong. It's pretty and applies fairly evenly. I'm torn on whether I prefer one or two coats. Cloud 9 is a tangerine shimmer. Can't argue with that shimmer, but this is four coats! Four! Undies next time, for sure. Cauldron Couture is like a green version of Splatter Spell. I'm not as nuts over this as Splatter Spell, but it's still pretty cool and I hope they do a few more variations. It applies really easily and the few shards there are don't poke out excessively. Rerun time! Click the shade name to see my previous review. 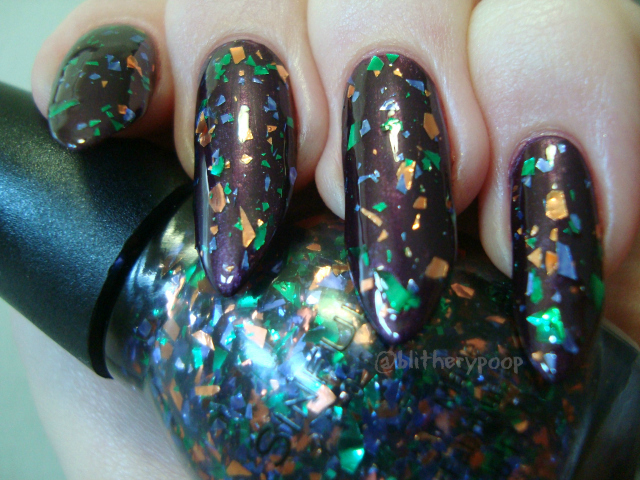 Bottom line: I love Splatter Spell way more than I'd expected! Mystery Moonshine is pokey and kinda disappointing. Pumpkin Spice is one I feel like I should have bought when it first came out. Pine Away is cool and I'm happy to see it return. The rest are core or return often in seasonal displays. I still can't believe I bought the wrong polish! I even checked my spreadsheet! Oh well... Hopefully the Walgreens near my dentist's office will have it and I can stop in on the way home and exchange for it. I think this years Pumpkin Spice might be different. I picked it up either last year, or the year before, and this year's version seems different, more richer and has a more russet tinge to it. And the older version seems brighter and you can really see the red and the gold. Splatter Spell looks really good over Wet n Wild Roadwork!